chickenstrip This post is not being displayed . Posted: 20:53 - 22 Aug 2018 Post subject: Sticking a leg out. As I understand it, this is done to help slow the bike and/or get it turned, right? 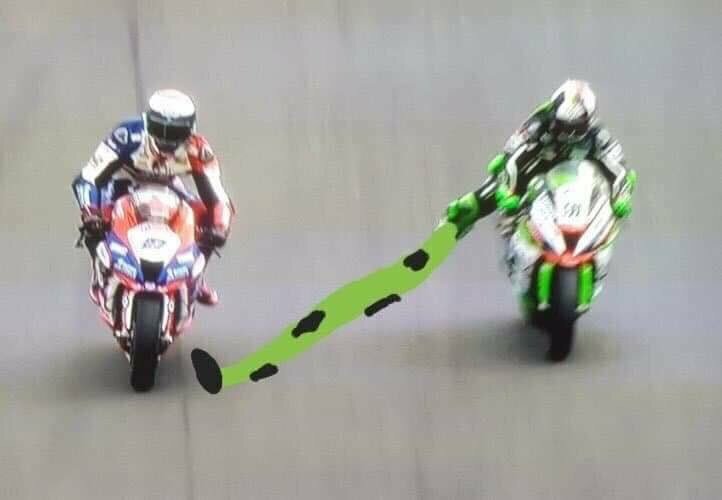 But I've just watched Leon Haslam seemingly using it in BSB at Cadwell to defend from Jake Dixon - to make himself wider? That can't be allowed, is it? Howling Terror This post is not being displayed . I suspect there are rulings along the line of 'must not block rider with appendage' but as blocking and block passing plays a large part it's now a part of the game.....albeit quite rare. Some of my replies are relevant. Old Git Racing This post is not being displayed . Was there, thought it was out of order. 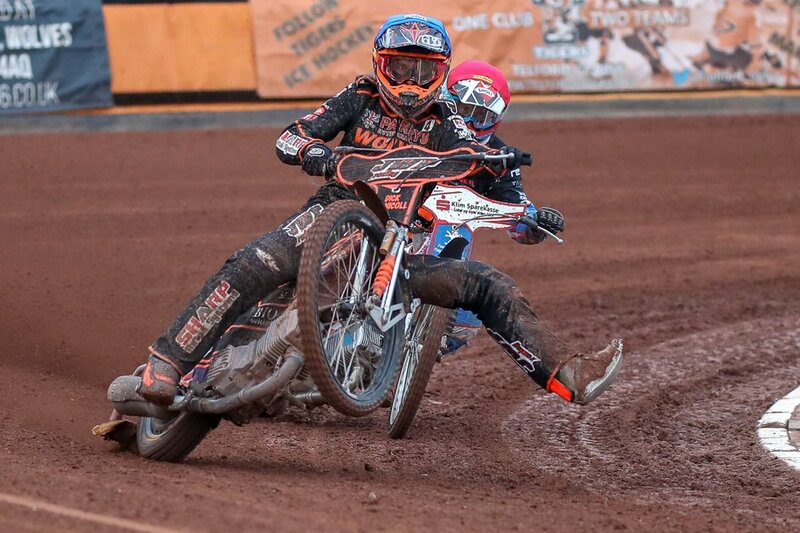 Jake wouldn't have hit Haslams bike but would have hit his leg. Block passes have always been part of racing, just that we have a cool name for it now. Dangling legs looks sketchy to me, you even see poseurs doing it the road now. Does it contribute to a faster lap, I think not but then again maybe I am missing something. Would I have gone for the gap and ignored the leg? Yes. someone needs to do it and bring it to a head. Yamaha 350 YPVS x 2. BMW R1150R. Random bits of mates broken bikes. kgm This post is not being displayed . I think it just really became the fashion when folk saw Rossi doing it. I'm pretty sure i saw an interview with him where he said that the leg dangle was more of a psychological ritual type thing than anything else. Use as a blocking technique does make sense even if it is a little snidey. I imagine it probably has some effect on the balance of the bike but whether it's enough to makeucj of a difference is debatable. In Motocross it has more tangible benefits. weasley This post is not being displayed . I have never heard a convincing explanation of why it is done. Rossi started it, and he was winning so it must be the leg thing, so I’ll do it and I’ll win, right? Most ‘explanations’ I have heard come across as post-rationalisation, making up a technical-sounding reason because “because Rossi” doesn’t sound good. MarJay This post is not being displayed . I always thought it was a way of getting even more weight over the front end under braking, and maybe settling the bike to be ready to shift bodyweight in the corner. It's definitely not used as a blocking technique, there just isn't enough coverage. It may very well be a psych out on Rossi's part, but I'm more inclined to believe he was using it to ride around some bike issue like chatter or something. Remember kids, bikes aren't like lego. You can't easily take a part from one bike and then fit it to another. The Motocross scenario is different where you're shifting your whole bodyweight forward as you stick your leg out I'd suggest. Most of the top riders did it this way, but no one could say why they used this technique - it was just presumed to be part of the overall package you need to win. Eventually someone traced it back through a variety of top riders who remembered learning it from seeing others doing it. The originator it turned out, only had one eye and that was the only way they could see to that side! Kawasaki Jimbo This post is not being displayed . I always thought it took the riders weight off the pegs and so dumped it onto the seat, helping to keep the rear end down under braking. However the riders themselves don't seem to know why they do it, so it's probably just something which feels right when you've spent a lot of time training on dirt bikes. I always thought it was a way of getting even more weight over the front end under braking, and maybe settling the bike to be ready to shift bodyweight in the corner. It's definitely not used as a blocking technique, there just isn't enough coverage. I don't know, I maybe thought that until this incident I mentioned. Seemed to me Haslam stuck his leg out almost to a horizontal position at full stretch one time - it definitely made a significant difference to the room Dixon had to try a move on his inside. My comment on what its actual use is generally, came from what I heard on some race commentary or other once. I figure if it was just a fad started by Rossi, it would die out, but it has only got more common. I mean, it's common in MotoGP, and you'd think anything at that level that was a waste of time and effort would be quickly discarded. UnknownStuntm... This post is not being displayed . common in MotoGP, and you'd think anything at that level that was a waste of time and effort would be quickly discarded. And yet still we see Karel Abraham making up the numbers. Back on topic. I think I remember Rossi said it was mind games when it started but he's seen so many people do it now it must have some benefit. Most likely the only benefit is psychological. NOS - Fork Seal, Dust Seal, 2 Bushes And Circlip For 1 Leg.